Origin and Habitat: Mexico (Queretaro). The species is only found in two small disjunct areas. This species is considered to be Endangered due to a very small and restricted population (less than 250 mature individuals), and a small extent of occurrence (less than 1,000 km2), and its populations are in decline due to habitat degradation and illegal collecting. Altitude range: It has a narrow elevational range, occurring on a mesa area (a flat area), at elevations of 1,660 to 1,890 m asl. Habitat: This species occurs in semidesert, and has a narrow range of tolerance in soil type. 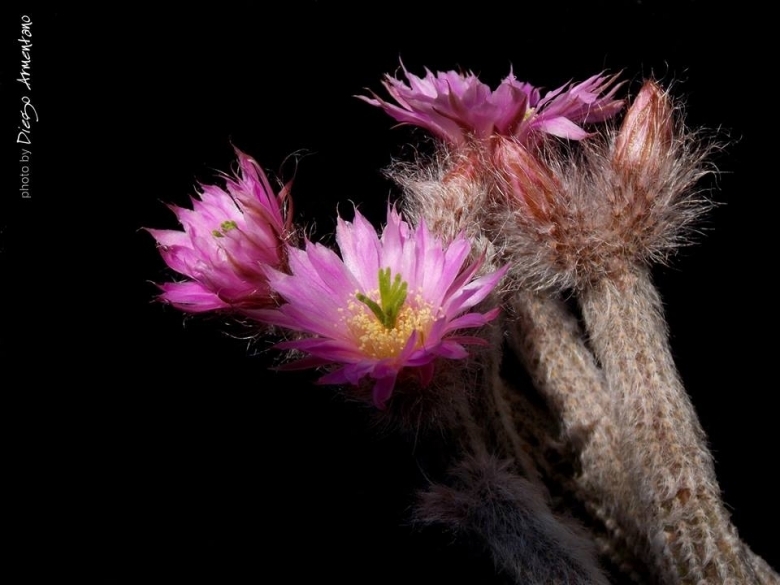 Currently Echinocereus schmollii survives in eleven restricted and localized populations from two disjunct small areas in an isolated region in the south of the Chihuahuan Desert. Even when individuals reach an adequate size to produce flowers, flower and seed production is scarce. 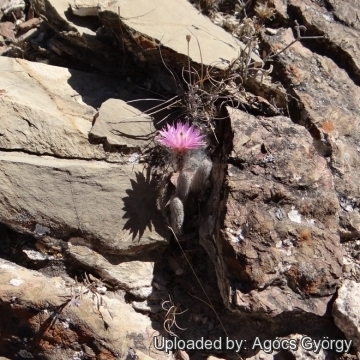 In the wild population regeneration is mainly driven by vegetative reproduction. It is sometime found growing together with Digitostigma caput-medusae. The populations of this species have been historically threatened by anthropogenic activities, such as road construction, fires, vegetation clearance, and also by farming and soil degradation (Hernández-Oria et al. 2006). Currently the predominant threat is habitat destruction due to mining practices, and there is more mining planned for the future. As it grows mainly in flat areas it is especially susceptible to agricultural activities. Echinocereus schmolii var. nerispina (A.Cartier) hort. Description: Echinocereus schmollii is a small usually solitary or scarcely branched cactus with tuberous roots and thin, limp stems that in the wild needs the support of some host bush branches, stem tend to snake around when plant is cultivated, if not supported with sticks. Echinocereus schmollii was originality named and for the long time called Wilcoxia schmollii. Stem: Pencil-like, thin, cylindrical, initially erect, later sprawling or clambering, purplish to blackish green, 25 cm long, 1 cm in diameter with 9-10 rounded tuberculate ribs. Spines: Up to 35 very thin, 3-7 mm long, hairlike, pinkish to whitish-grey, reddish at the apex, giving the stem a woolly appearance. Flowers: Showy, funnelform pink to magenta near the tips of older stems, 3-5 cm long,5-6 cm in diameter. Blooming season: Flowers are easily produced, usually several waves of blooms over the summer. Fruit: Ovoid or roundish, purplish green and juicy. Remarks: It apparently looks like some Peniocereus species. However the flowers, fruits, and seeds of Echinocereus schmollii are characteristic for Echinocereus, somewhat comparable to those of Echinocereus reichenbachi. Echinocereus schmolii var. nerispina (A.Cartier) hort. : has darker, stiffer spination. Distribution: Mexico (Queretaro). 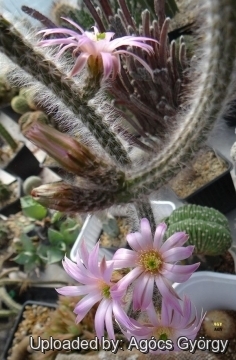 Echinocereus schmollii (Weing.) N.P.Taylor: has pencil-like stems to 25 cm long, 1 cm in diameter. Spines 3-7 mm long, hairlike, pinkish to whitish-grey, reddish at the apex, giving the stem a woolly appearance. Distribution: Mexico (Queretaro). 1) Sánchez , E., Guadalupe Martínez, J. & Bárcenas Luna, R. 2013. Echinocereus schmollii. The IUCN Red List of Threatened Species. Version 2015.1. <www.iucnredlist.org>. Downloaded on 22 June 2015. 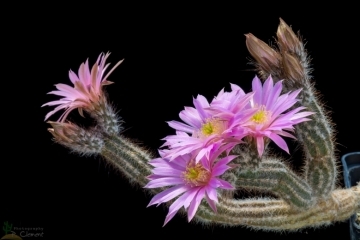 Cultivation and Propagation: Echinocereus schmollii is used to be considered difficult and somewhat rare in cultivation. It likes regular irrigation at time of growth, but do not over water. Frost hardiness: It is quite frost hardy -7 (-10)° C.
Maintenance: During the winter months it may become dormant, during which no moisture is required, and the plants should be grown cool and dry (at -5 +10°C). This is important for the flowers as well as for its health. Without this cool winter period it normally won't get any buds. Propagation: Seeds (usually), it also can be grown from stem and root cuttings.